Episode 21: "Three Men on a Raft"
Passing through London on his way to Paris, Charlie Chan, without Number One Son, Barry, visits a book shop while author Tony Hathaway participates in a promotion for his latest book Memory of Terror. Suddenly, Chan notices a young boy pulling out a pistol and take aim at the author. Quickly, but discretely, the detective stops the child, disarms him, and escorts him outside of the shop. The boy, Ronnie Ramsden, tells Chan that he tried to kill Hathaway because of the vicious lies that the book contains about his diseased father. Suddenly bolting into the street, Ronnie is struck and seriously injured by a passing vehicle. At a local hospital, Chan informs Ronnie's mother, Norma, about the boy’s attempt on Hathaway's life. Mrs. Ramsden states that she, too, is devastated by the author’s accusations. She also tells Chan that she will soon wed Sir Arthur Ruggles. A doctor enters to inform Norma that her son is not responding to medical treatment, seemingly lacking the will to live. To this, the detective adds, "Something of great importance has been taken from the boy, doctor." Visiting Hathaway's publisher, George McDowell, Chan finds the author there, as well. As Chan tells the author of the anguish that his book has caused Captain Ramsden's son, Hathaway storms out. Chan tells McDowell that only the author's version of the tragic story has been told, and that there were two others on the raft, Captain Ramsden, who perished, and a Chinese steward, whose stories were never heard. Back at the hospital, Chan tells Ronnie that he believes that Hathaway's book does not tell the truth about his father. The detective tells the boy that he will take the case, agreeing to work for the three pounds Ronnie has handed him, on the condition that he will pay Chan on Waterloo Bridge when his father's reputation is cleared. Ronnie agrees, and takes a dose of his medicine from the hand of the detective. Later, Sir Arthur Ruttles stops by Chan's hotel to convince him to drop the case in order to spare Ronnie and his mother any unnecessary anguish. Chan, explains that he is working for Ronnie and that "my young employer seems most satisfied with humble efforts of retired policeman." Chan then receives a phone call from McDowell, who gives him the whereabouts of the Chinese steward, Mu Lan, stating that he will pick him up to take him there. Hathaway, who was next to McDowell during his call to Chan is told by the publisher not to worry about Mu Lan, now. At Mu Lan's flat, Chan is informed by the landlady, Mrs. Dawkins, that Mu Lan passed away six months earlier of pneumonia. Later returning by himself, Chan pays off Mrs. Dawkins to give him truthful information about the Chinese steward. It seems that Mu Lan never lacked for money, even though he never appeared to have employment. Chan also finds a diary written in Chinese. When told it belonged to another Chinese man, Chan states it "now belongs to Mu Lan." Hathaway is visited by an elderly Chinese man who introduces himself as Chung Lan, uncle to Mu Lan. Showing the diary, he tells the author of the very interesting nature of the contents and how what is written differs from what Hathaway has penned in his book. Telling the author that the diary is worth a lot of money, Chung Lan suggests that the two can meet at Mu Lan's flat at midnight. Later, as Chan visits Ronnie, who is accompanied by Sir Arthur, in the hospital, he tells Ronnie of the existence of the diary and how Chung Lan will be at Mu Lan's residence at midnight. Hathaway, who has overheard this, calls Mrs. Ramsden, telling her that the sudden appearance of the diary makes it imperative that Charlie Chan drop the case. Trying to convince the detective, Norma offers Chan money, telling him that the truth contained in the diary could be even more harmful to Ronnie that the falsehoods in Hathaway's book. Regretting he cannot drop the case, Chan tells Mrs. Ramsden that she can speak with Chung Lan himself that night at midnight to find out the contents of the diary. On his way to Mu Lan's flat, Chung Lan is accosted by two attackers whom he successfully fends off. One of the thugs tells Chan that he does not know their identity of the person who paid them to attack the old man. Soon, at the boarding house, working with Mrs. Dawkins, Chan, disguised as Chung Lan, first meets Hathaway, who offers money for the diary. Mrs. Ramsden then enters. The disguised Chan tells her that the diary has much to say about her and Hathaway, things that could ruin them, noting that the price of the diary has just increased. Hathaway admits that on that night on the raft, he accidentally killed John Ramsden to which Norma states that his book is filled with lies, including that her late husband behaved that night in a cowardly manner, all to cover for himself. McDowell arrives, soon admitting that it was he who sent the two thugs to stop Chung Lan. Pulling out a gun, Chan, still posing as Chung Lan, informs that the act of violence has caused the price of the diary to increase further. As Sir Arthur enters, McDowell grabs Chan's gun, demanding the diary, stating that its contents could ruin his publishing company with the resulting libel suit. He knew that Hathaway's story was a fabrication, but wanted to reap the benefits of a sensational best seller. Chan then tells McDowell that the gun he has is not loaded as he pulls out another, loaded pistol, revealing his true identity, later revealing that the "diary" is actually a Chinese cookbook. Mrs. Dawkins, who has been listening outside the door, tells Chan how she has heard everything and can testify at a libel trial. However, Chan offers an alternative in the form of a statement regarding the false nature of the account related Hathaway’s book, which is signed by Hathaway and McDowell to be given to the newspapers for publication. Mrs. Ramsden states that she had feared that the contents of the diary would ruin her chances of a happy marriage. Sir Arthur then tells that his purpose in obtaining the diary was to destroy it for the sake of Norma and their marriage. The next day, on Waterloo Bridge, Charlie Chan meets with Ronnie, as promised, showing him how the truth regarding his father has been revealed to the world. 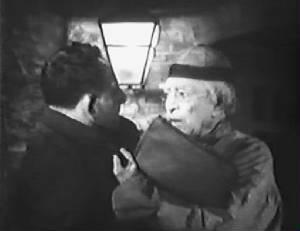 Ronnie pays Chan the three pounds, which the detective secretly slips back into the boy's pocket. 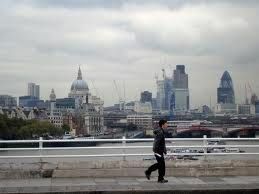 Charlie Chan (to Book Shop Manager): "Just passing through London on my way to Paris." Charlie Chan (to Sir Arthur Ruttles): "Please excuse informal attire. Chinese brain working, but feet have gone on strike." 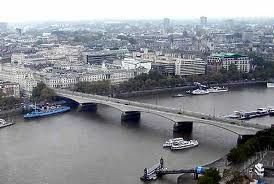 Waterloo Bridge - Crossing the River Thames, the current road and foot-traffic bridge was completed in 1945 and offers beautiful ground-level views of London, including the dome of St. Paul's Cathedral (seen below) which Ronnie pointed out to Charlie Chan. St. Paul's Cathedral - The dome of St. Paul's Cathedral, seen in the distance as Charlie Chan viewed it from Waterloo Bridge, is the fifth cathedral to have stood at that location since 604. It was built between 1675 and 1710, after the previous cathedral was destroyed in the Great Fire of London. 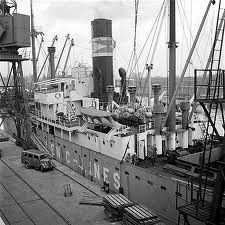 India Docks (West India Docks) - The location in London where Mu Lan, the Chinese steward and one of the three men on the raft, lived. Loaded gun and angry boy very bad companions. Patience can find smallest needle in largest haystack. When trap is well-baited, no need for hunter to hasten to spring same.